New Right leaders pledge to 'free IDF from court restrictions preventing soldiers from defeating terrorist organizations'. 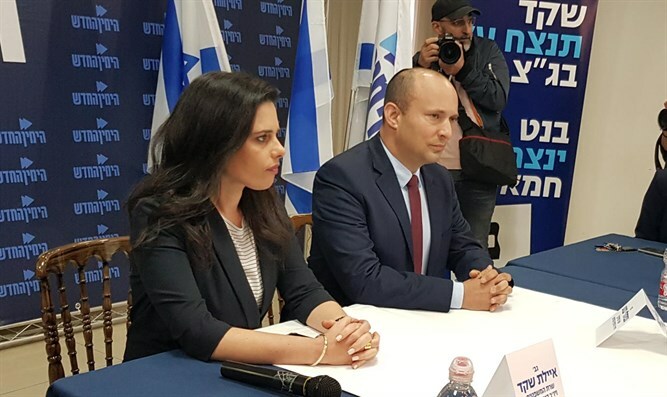 New Right leaders Naftali Bennett and Ayelet Shaked convened a press conference on Sunday to launch their party's new election campaign. At the press conference, the party leaders clarified that their campaign would focus on the phenomenon of legal red tape tying the IDF's hands. "My mission and that of Ayelet Shaked is clear: to release the IDF from the High Court so that the IDF will defeat Hamas," Bennett said. "The IDF does not issue a demolition order because a person was only seriously injured and was not killed because the IDF knows that the High Court of Justice will throw it out. This is the Israel of 2019, and this is the result of legalization that permeated deeply into all the government systems, especially the defense establishment. IDF soldiers think five times before they shoot terrorists, for fear they will be tried. IDF soldiers think five times before they shoot terrorists for fear they will be tried," he added. "The time has come to say honestly: The High Court of Justice ties the hands of IDF soldiers to defeat terror, and in order to defeat Hamas, the IDF must be freed' from the High Court of Justice," he said. "The time has come to put the right of life of the Israelis above the human right of the terrorists," Bennett said. "The Israeli public did not choose the judges, but they are running as if they are the legislative and executive authority." Ayelet Shaked referred to the deadly attack which occurred in Samaria Sunday morning: "Terrorists embarked on a murderous march against Israelis. We send our condolences to the families. Again we will hear the slogans 'We will bring the terrorists to justice', but again, nothing will happen to them." "The terrorists are not afraid for a number of reasons, one of which is the legalization of the IDF," Shaked added.